Pool area of the new Cabana Bay Beach Hotel, a budget Loews Hotel at Universal Orlando. Where to stay in Orlando? We offer some suggestions on the Universal Orlando campus, as well as some other fun options (Sponge Bob, anyone? ), golf resorts, condo rentals and more for your consideration. 1. Gaylord Palms Resort – In the family hotels capital of Orlando, this convention-welcoming hotel boasts a little something for everyone in the family; here’s how it rates. 2. JW Marriott Grande Lakes – Orlando, Florida’s first truly upscale resort caters to the luxury-minded family with golf concierges and kids’ spa treatments. 3. Delta Orlando Lake Buena Vista – In association with Marriott International, the first of the Canadian Delta chain is now in Orlando. So close to Walt Disney World Resort, you can almost hear Donald Duck. Working out in the gym, and playing in the pool and kid’s area will round out the day. 4. 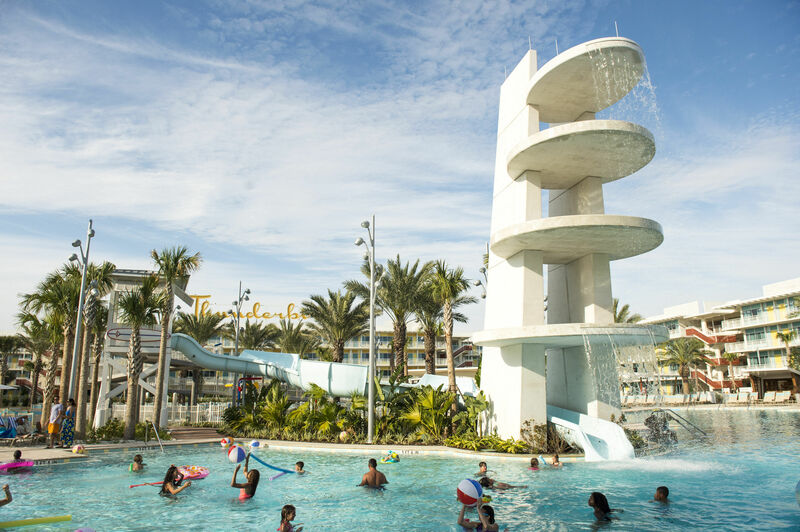 Loews Hard Rock Hotel At Universal Orlando – This family-friendly Hard Rock Hotel is not only adjacent to teens’ favorite themepark in Orlando, it also rocks around the clock with a beat that won’t stop. 5. Loews Portofino Bay Hotel At Universal Orlando – The most luxurious of the three Loews hotels in Orlando, the Portofino features family-sized rooms, a relaxing spa, evening program for 4 to 14-year-olds and supervised care for babies from 6-months-old, all with an Italian accent. 6. Loews Royal Pacific Resort At Universal Orlando – We love Orlando’s elegant Royal Pacific Resort because its gurgling fountain and tall teak ceilings transport us to another, more tranquil place after a day on roller coasters. 7. Omni Resort At Champions Gate, Orlando, Florida – Business and leisure travel peacefully co-exist at this luxurious, yet family-friendly, urban hotel. 8. Orlando’s Best Resorts For Reunions – Central Florida offers many comfortable, fun condos for all ages and mobility levels. 9. Orlando World Center Marriott Resort – Marriott hospitality, lots of activities for kids and teens and a great pool complex makes this a good choice to unwind at after a day at the parks. 10. Delta Hotels Come to Orlando – We love the Delta Hotels chain from Canada so when the Nickelodeon Family Suites Hotel closed — a past winner as a ‘Top Active Getaway for Family Togetherness’ — we chose to include the Delta.